The Kardashian Clan has been really active in the past few months with Kylie, Kim and Khloe’s new babies, another drop of Kylie and Kim’s makeup line and Kendall and Kylie’s clothing line. All eyes have been on the Kardashians because of the three pregnancies that were all announced this past year and had coinciding births. Moreover, each birth was particularly special. For Kim, this pregnancy was her third child with Kanye and they used a surrogate because Kim has had complications with pregnancy in the past. Kylie had her first child with Travis Scott, only revealing her pregnancy after the birth and a nine month social media blackout. Finally, Khloe gave birth to her child while the videos of her baby daddy, Tristan Thompson, cheating surfaced. During all of this, Kanye West has been hard at work. Kanye reinstated his Twitter on April 13th, 2018. Immediately after returning to Twitter, he called out Nike for copying the style of his Yeezy Boost 700 Wave Runners, the Nike Monarchs having a similar clunky style. He later deleted that Tweet. He then went on to tweet about the philosophy book that he is writing called Break the Simulation. This book would have been highly anticipated with people intrigued on how the genius Kanye West thinks and lives his life. Kanye revealed that his book would be published on Twitter, accessible to the masses and completely under his own control. He then tweeted a series of thoughts like “if you wanna see the true character of person watch the way they treat someone who can’t do anything for them,” “don’t trade your authenticity for approval,” and “in life, we are all trained actors. When we’re born we’re ourselves and then one of the first things we’re thought is how to act. If you see a kid screaming at a restaurant because he feels something and can’t express himself in a conventional manner.” Some of his tweets are more profound than others but he keeps true to his character and philosophy because he explains how to break convention, create one’s own path and how to be true. Kanye has always been unconventional in everything he does, revolutionizing music, fashion, and now even philosophy and publishing. Kanye’s use of Twitter as the form of his book is seemingly silly and stupid but it shows the true artist that Kanye is. He does not produce for the fame or for the money, he produces because he has an innate need to create and to share with the world. 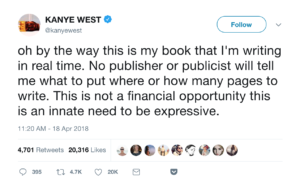 Kanye’s book would have sold easily, and the book tour would have been packed but instead he chose to make sure that everyone could see his unfiltered thoughts and that everyone could see it. Finally on his Twitter feed, Kanye revealed that his next album will drop June 1st, his new music group Kids see Ghosts, his album with Kid Cudi drops on June 8th, Teyana Taylor’s on June 22nd and Pusha T’s on May 25th. He also then revealed prototypes of his next fashion collection. Summer 2018 is Yeezy Season. Senior Jesika Islam is a Senior Editor. Her email is jislam@fandm.edu.